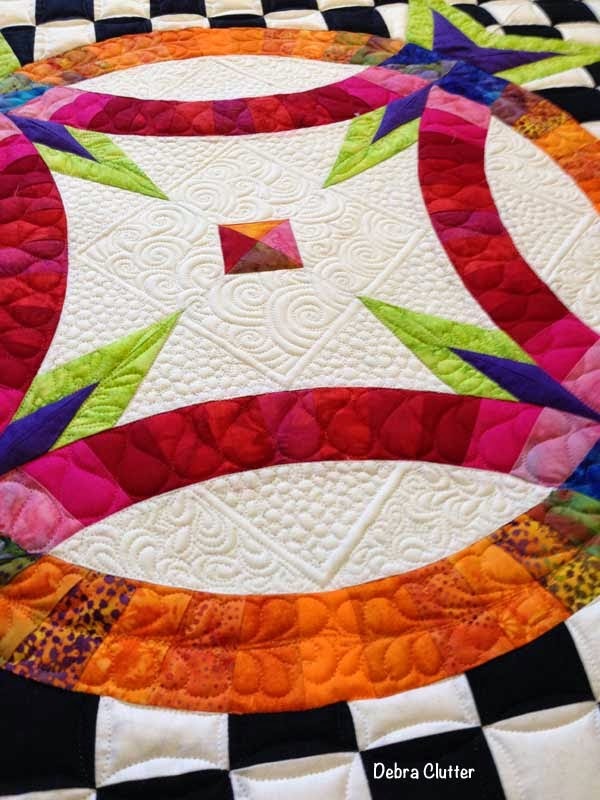 I have heard from many people on the quilt boards that they don't like Double Wedding Ring Quilts. I am not a fan of the traditional design. I especially do not like the ones with the odd melon shapes where the rings are not round. 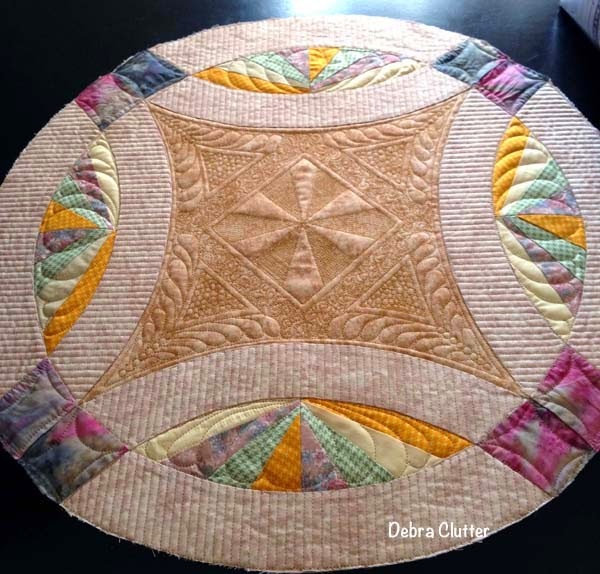 The very first quilt that I bought out of the department store was a double wedding ring. It was the first time I ever spent that much on bedding! I loved that quilt and it is still in the family. 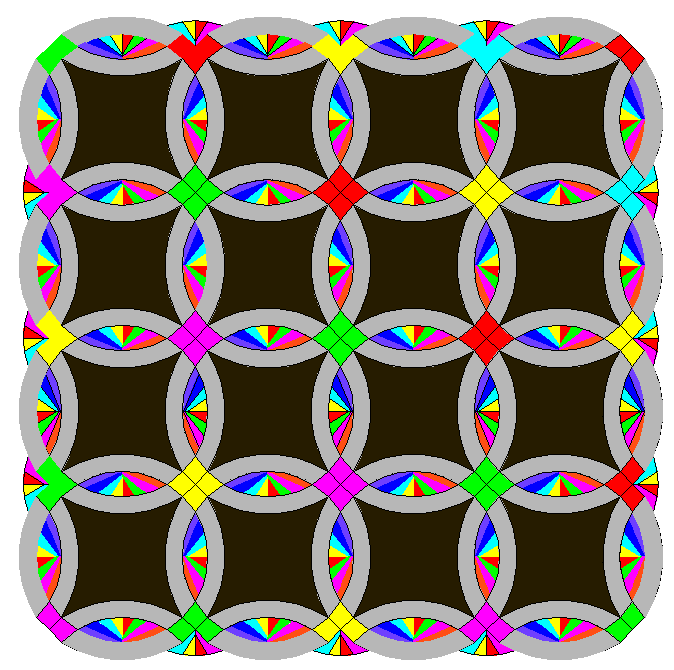 That quilt represented I time in my life were I was starting to not have to struggle for ever last dime. It is when I started my job at my current place of employment. That was 17 years ago. I had been looking at double wedding rings for a while and I was thinking that I would like to make one. I wanted a more modern one with out little flowers on the fabric which the one I bought had. I bought the pattern from Sew Kind of Wonderful for their Metro Rings but never even read it. I have a problem with following other peoples patterns. I always want to redesign them. 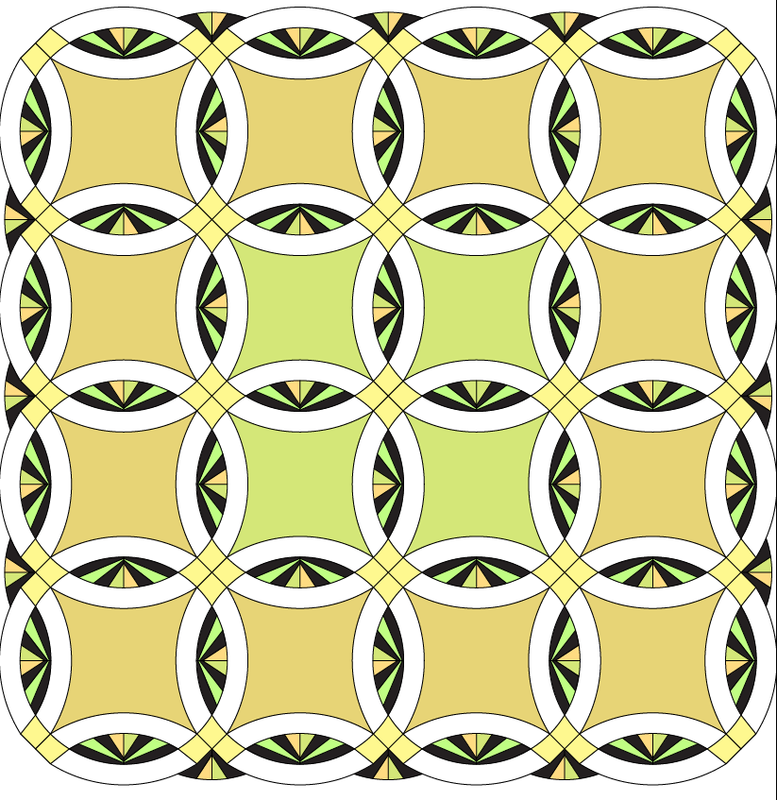 I love the pattern and I think I will force myself to make it some day. What I really wanted was a Wedding Ring Quilt with big rings. So I started drafting one up. I really had no idea how the original ones where designed. I just started drawing rings and joining them. Well that started my obsession! Now I have all these ideas for designs and not enough time to try them out. I am wondering when I will get bored and move on. 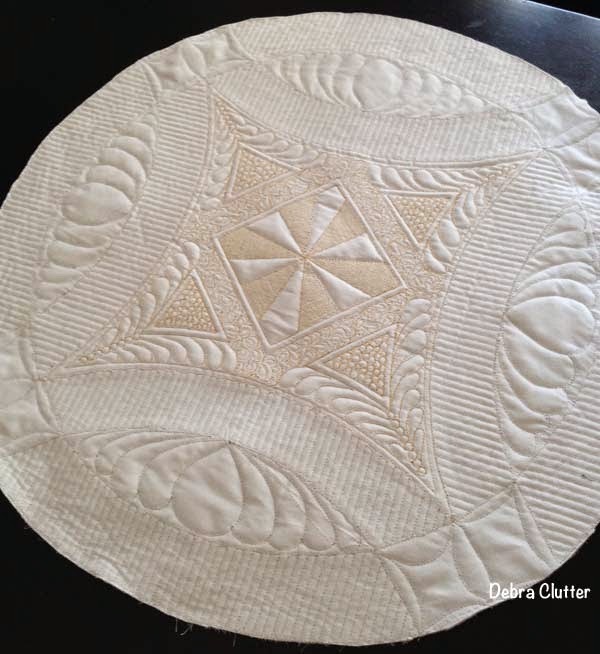 The first sample I did was for a large quilt I was think of making. I had no idea how to put a wedding ring quilt together so the piecing is not that great on this one. Though I still love the bright colors. I just used some scrap to make it. 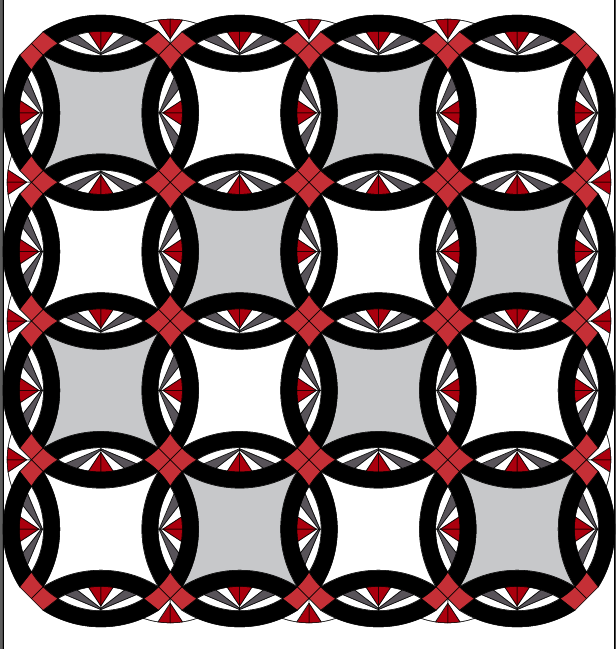 I bought the Craftsy Class on Double Wedding ring quilts and that helped to understand how to put it together. 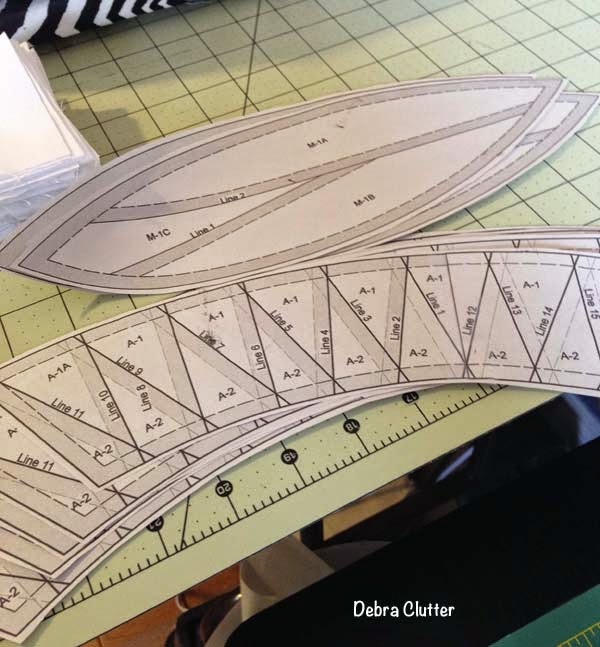 I revised the pattern because all the seams coming together at the end of the melons drove me nuts. The picture below is the revised pattern. 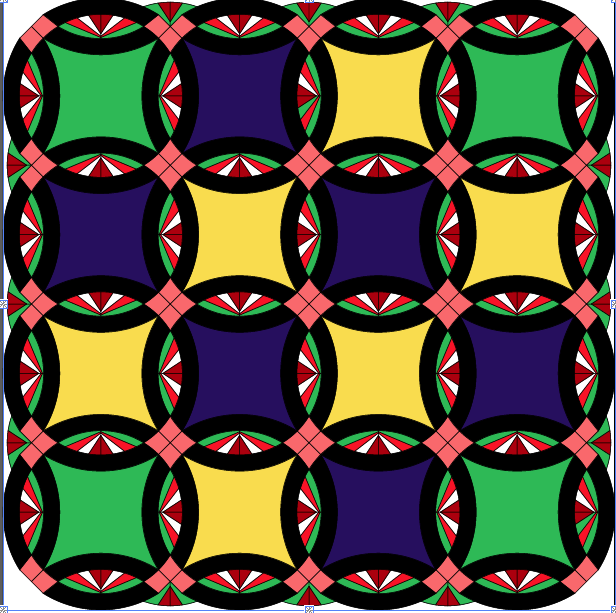 I also still have the pattern with the checked background. 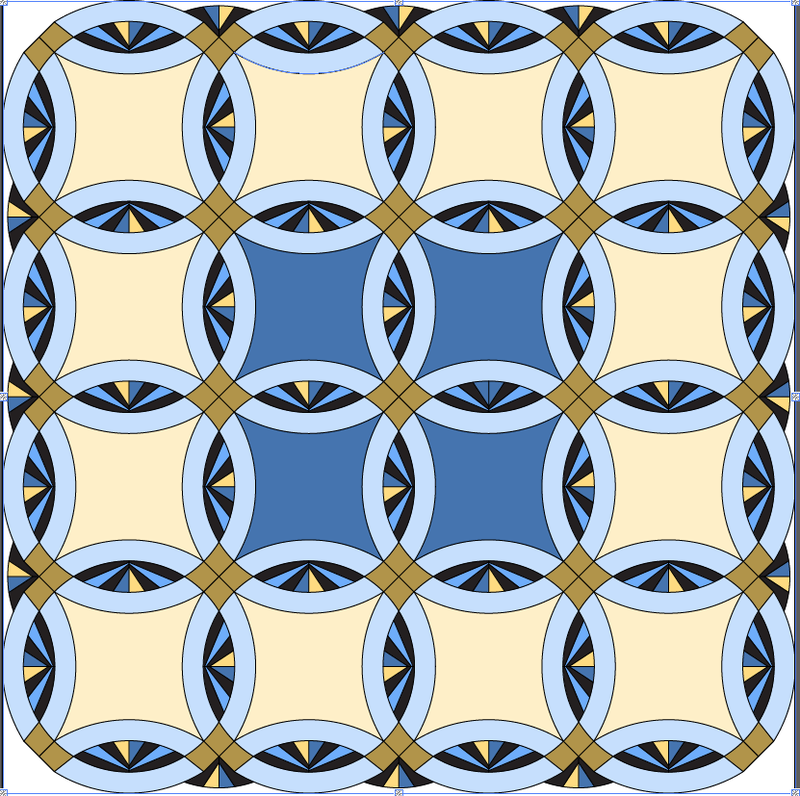 I have a bunch of Indigo fabric that I would like to use for this pattern. 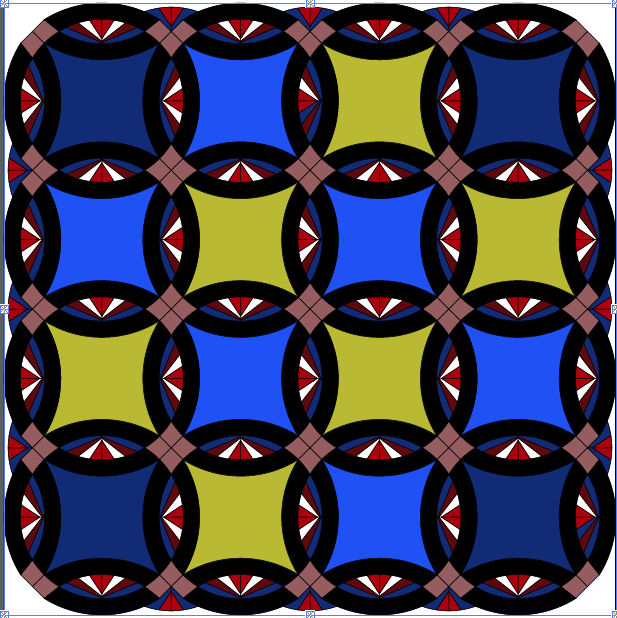 This pattern is called "For the Love of Indigo". The Next Sample was for one that is a little simpler. I call this pattern Color Splash. I used scrap again to create the sample. 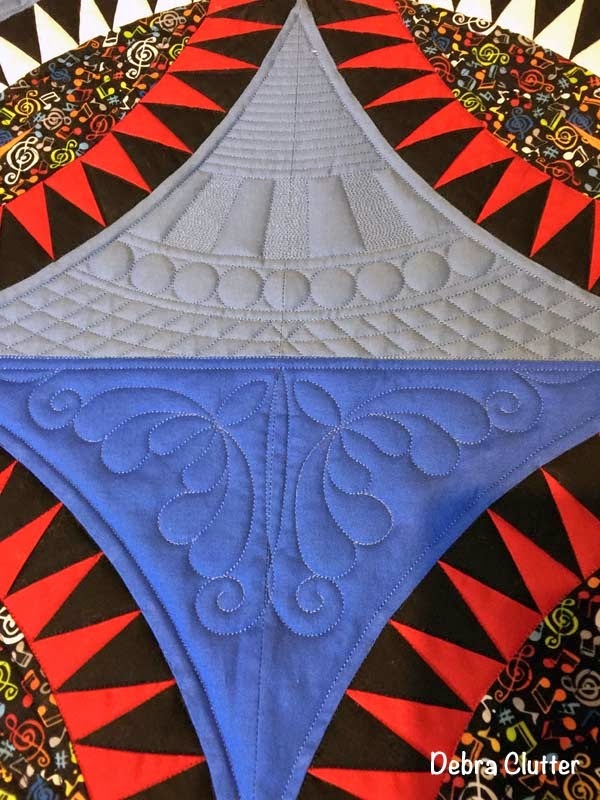 I was thinking the fabric was really ugly until I quilted it! 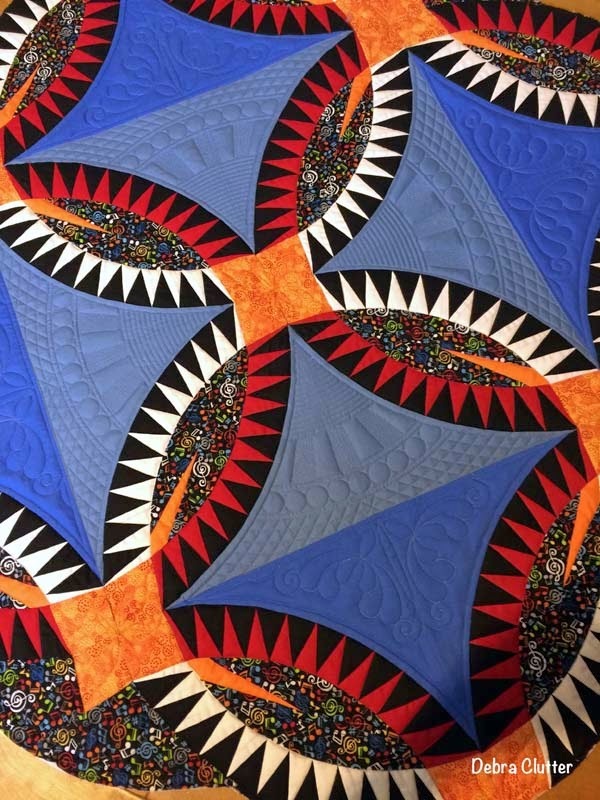 The quilt guild I belong to had a challenge. 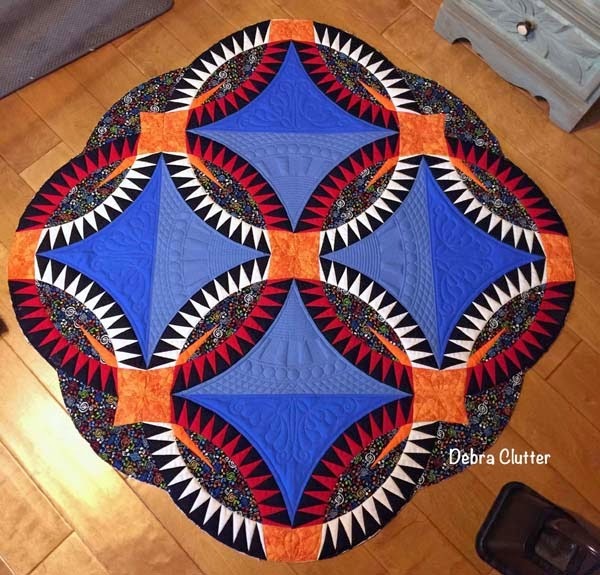 You had to make a quilt that was red, white and blue with other colors if you choose and it had to be under 50". 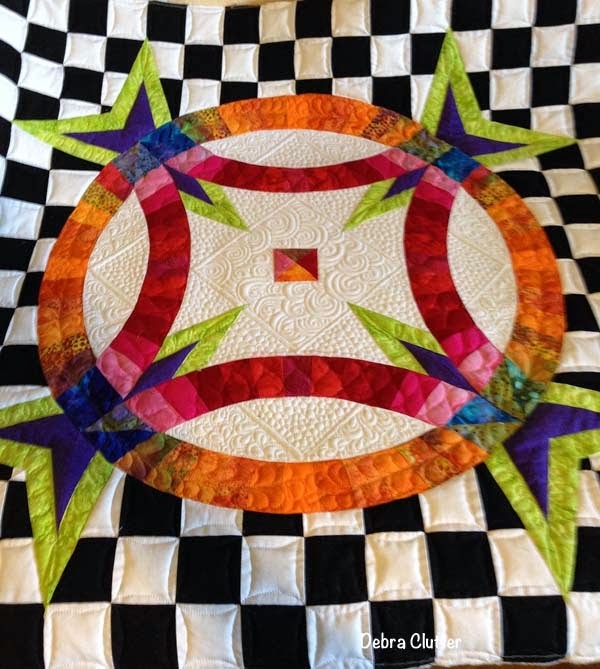 So I decided to try another variation of the quilt called "Radiant Sun". Here is the quilt before I have put the binding on. I am currently finishing the binding now. 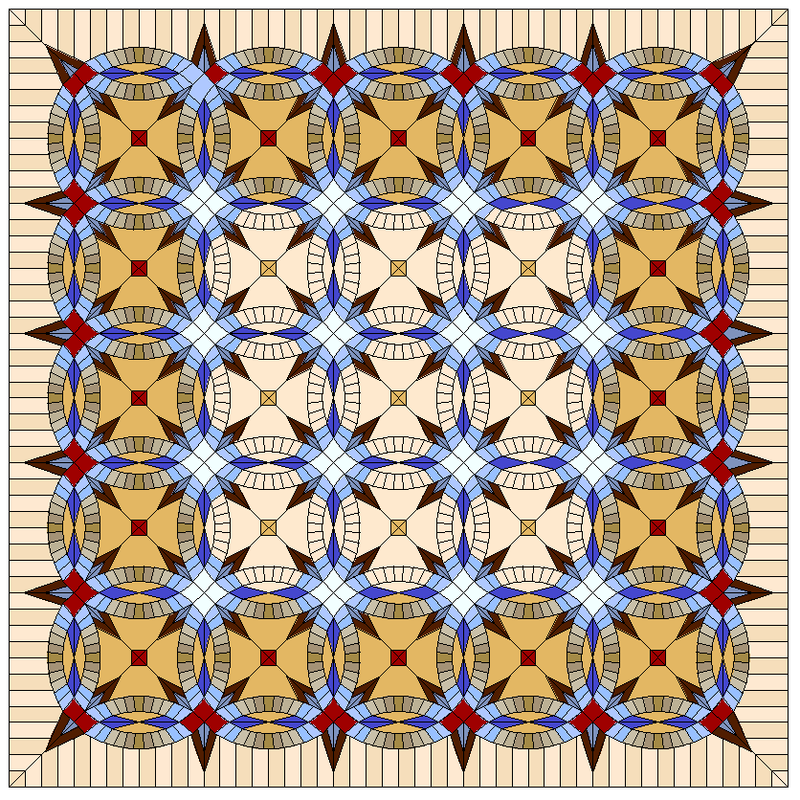 This is a picture with it on the quilting frame. 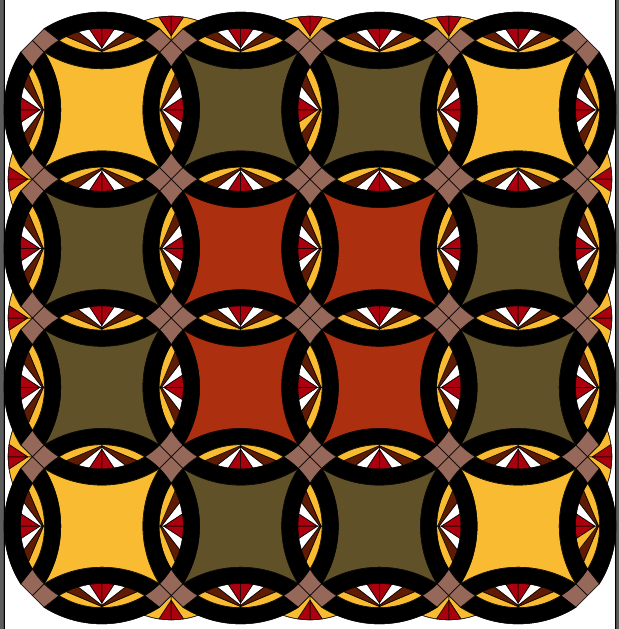 I digitized all the quilting patterns for this quilt. I also SID every seam. 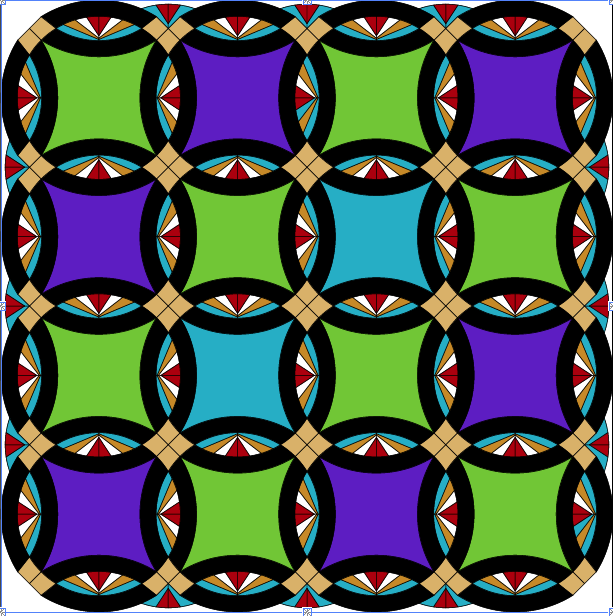 I think I will modify the quilting pattern to include something more at the point. 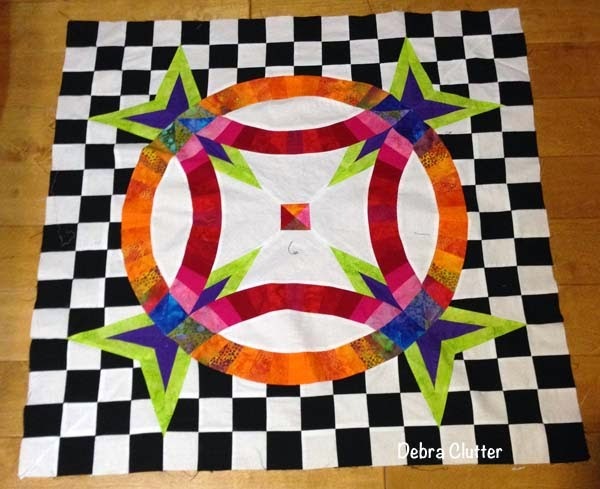 Here is a picture of the paper pieced patterns I made for this quilt. This quilt took a heck of a long time to finish. I think I will go back and modify the pattern some. It was very challenging to piece. 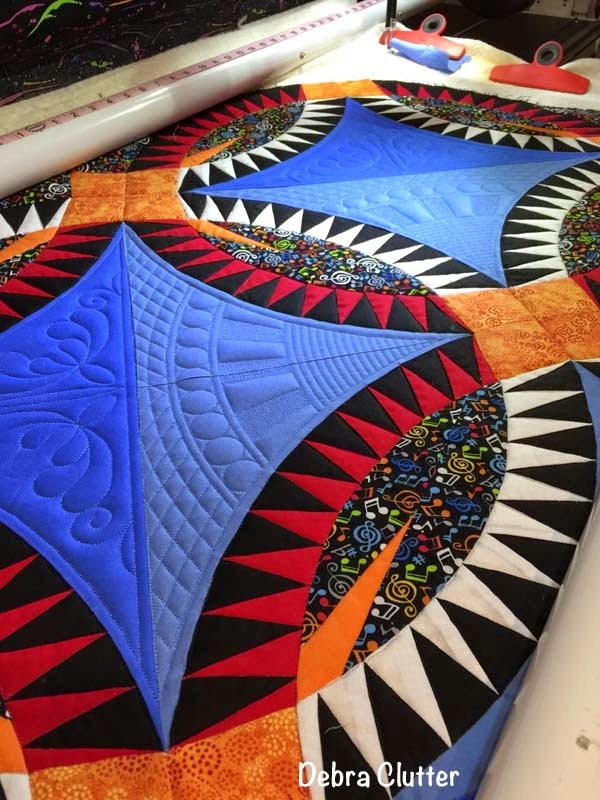 Below is the Color Splash quilt version of the DWR I am working. 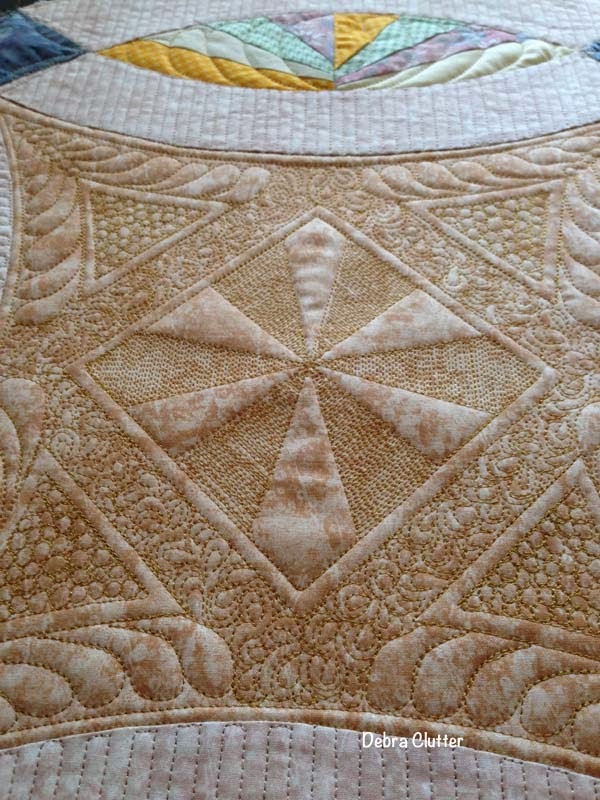 It will be quilted like the sample above but with colored thread. 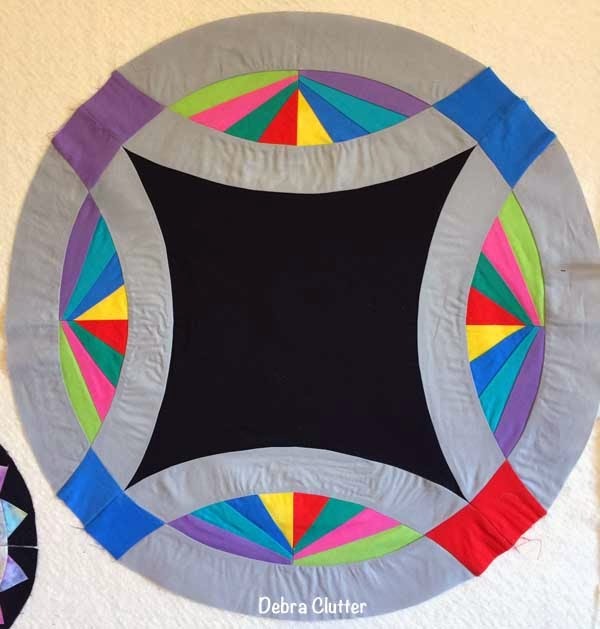 I have a ton of color versions for this quilt. Here are some of my favorites.